After QE2, analysts were looking for possible consequences of the Federal Reserve Bank’s actions. What has become apparent is that the Fed has created another bubble in China. Investors globally have transferred devalued U.S. dollars and Euros to buy Chinese property and equities. China has had to combat imported inflation with rapidly rising asset prices. An influx of capital has caused a real estate bubble, a rise in costs of basic goods and excessive speculation in the commodity markets. The Chinese Central Banks will be observing the inflation data which should be coming out this weekend and will be compelled to act aggressively to prevent China from a bust similar to the housing crisis which occurred in the United States in 2007. Yesterday’s IPO’s showed that irrational exuberance is here once again, none since I have witnessed since the late 90’s. I never grew so fearful of the Chinese market until I began hearing the fanfare around yesterday’s IPOs. I began to read the marketing language around the IPO and began to have strong feelings of deja vu from the late 90’s. I felt like I was reading something that I read almost ten years earlier with a company called boo.com. Boo.com was also labeled the next amazon. They were also underwritten by Goldman Sachs (GS:NYSE). Boo.com burned through $185 million dollars in 18 months and did not make any profits. Investors were wiped out. IPOs are a measure of market sentiment. Companies come to the market as the future looks bright and are expected to expand. A pattern of IPOs begins to show over enthusiasm and possible peaks in the market. The number of IPOs is a useful tool for technicians to confirm tops and troughs in the market. Investors are obsessed with China, just like the IPOs in the late 90‘s right before the tech bubble burst. They piled into two new IPOs Youku (YOKU:NYSE) and Dangdang (DANG:NASDAQ) who are not showing much of any profit and only offering panaceas. This year approximately one in four IPOs are Chinese companies. Investors are expecting exponential growth and even though they have been marketed as the next youtube and amazon.com, both companies have a long way to go. They are currently not making much profit at all. Lessons should be learned from the tech bubble Highly marketed IPOs should be viewed as a contrarian signal. Ironically, these latest IPOs come at a time when the Chinese central banks is committed to fighting excessive speculation. 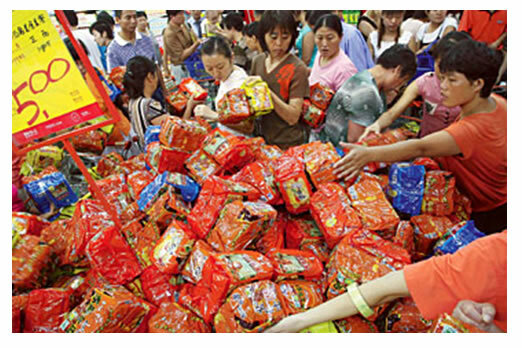 International markets are going to carefully examine China’s inflation data, to be released this weekend. This information should evoke Central Bank response by early next week. 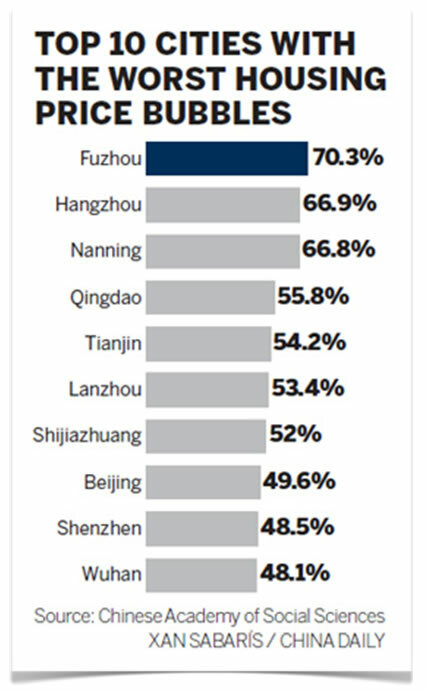 The chart above shows the rapidly accelerating price appreciation of housing markets in China’s major metropolitan areas. China has already implemented regulations to curb rampant speculation in their housing market. Many investors are unaware of the rising dangers of externally generated inflation. Month after month applications to start real estate operations from foreign entities are doubling. The carry trade has become apparent. Investors are exchanging easy, electronically printed money for Chinese assets. The chart above illustrate the China 25 Index (FXI:NYSE) and shows a possible “V” reversal top and negative divergence. This is when price breaks into new highs, then with no warning, the price breaks the uptrend and support levels. The China Top 25 ETF (FXI:NYSE) broke through the 50 day moving average and has already failed to regain the 50 day on the upside once. Until it regains that 50 day, I am cautious on commodities and equities. Ideally a break into new highs should show some follow through strength and this has not occurred. The Chinese markets are showing weakness and this effect has morphed over to the precious metals and commodity market. It would be naive to think that a surprised hike in rates and a downturn in China would not put pressure on gold and silver. Gold (GLD:NYSE) and silver (SLV:NYSE) are beginning to show signs of bearish reversals after a powerful move. Open interest in gold futures peaked on November 9th, a major reversal day. A tightening policy in China could keep buyers away for a significant amount of time or until prices come down to a more reasonable level. The demand and consumption of raw materials in China has a major impact on commodities. It used to be that one had to watch a sneeze from the U.S., but precious metal investors need to also be aware of a sniffle from China.